In 1991 John was cast as Domingo Hernandez opposite Stephanie Powers (TV's Jennifer Hart of Hart to Hart). The musical, by Mike Leander and Edward Seago, with a book by Peter Jukes, tells the story of the rise and fall of a fictional matador, loosely based on the life of Manuel Benitez, also known as El Cordobes. 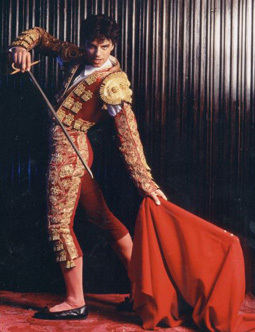 The show featured stunning choreography in traditional Flamenco style by Rafael Aguilar, for which show won an Olivier Award. Several dancers were cast directly from Spain, making their West End debuts. The bulls for the fighting sequences were performed by a group of black-clad dancers, moving as one. "John Barrowman brings a quite sensational stage presence - A star of incandescent charisma." 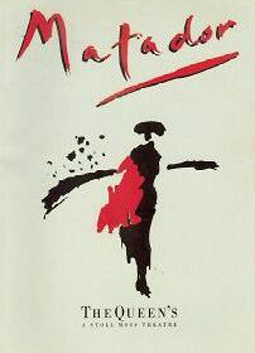 Unfortunately, in spite of the positive reviews, Matador ran for just three months. John recorded two songs from the score ("I Was Born To Be Me" and "I'll Dress You In Mourning") which were released as singles to coincide with the London opening. He later recorded "A Boy From Nowhere" on his solo CD, Reflections from Broadway.